A battery uses electrochemicals to turn oxygen and hydrogen into electricity. It has a fixed and limited capacity which will eventually expire or in other words, run dead. A generator uses mechanical action to create magnetic fields and thus produce electricty. This mechanical force can be a river, the wind or a fossil fuel. Without this outside force, the generator will not work. 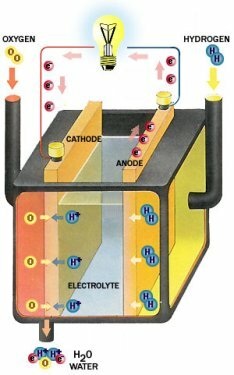 A fuel cell is like a combination battery and generator. Like a battery, a fuel cell uses an electrochemical reaction to produce electricity. Like a generator, a fuel cell needs a constant source of "fuel" to operate. The fuel for a fuel cell is hydrogen and oxygen. Most fuel cells use the air as its oxygen source, and a fossil fuel, usually natural gas, for its hydrogen source. In other words, if you were to have a fuel cell installed in your home to meet your electrical requirements, you would still need to supply it with fuel, just like you do your existing furnace or hot water heater. The challenge for science & business is to develop a fuel cell that will produce electricity cheaper on this small scale than the power companies on their large scale. And, this electricity has to be able to heat your house and hot water at less expense than your current appliances.